Around this time every year my son and I would take off on our Hadj to West Virginia and the white waters of the Gauley and New rivers. There’s n that way except mountains and river rats. The restaurant in Beckley that served this pizza is probably long gone – basil pesto, heirloom tomatoes, truffle oil and buffalo mozzarella not being much appreciated in those parts. However I ask myself, “is it possible to ever tire of that combination?” This is but another spin on the tous and ultra complimentary trio. 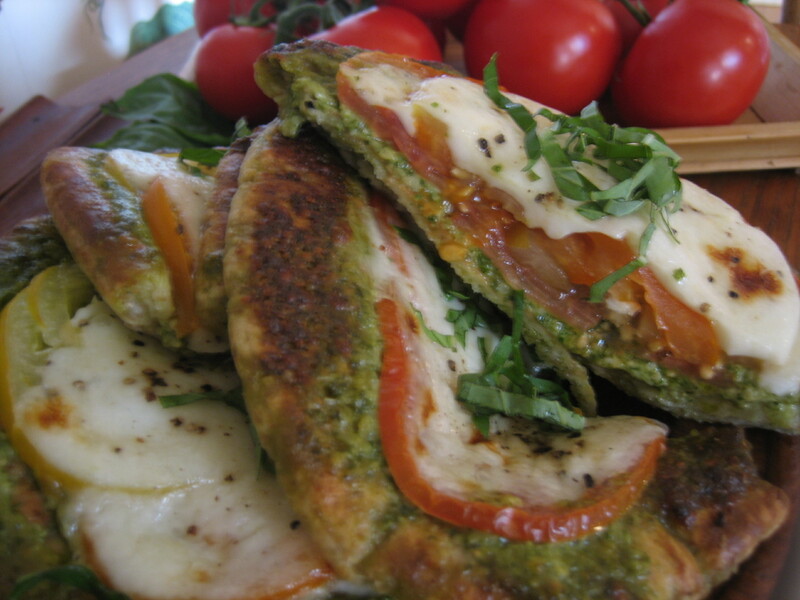 Spread basil pesto on the pita as desired. Overlap the tomato slices on top of the pesto. Top with the slices of Mozzarella and season with ground pepper. Bake in pre-heated 350F oven for 10 minutes or grill under an oven broiler. Remove when hot, brown and bubbly and garnish with the basil chiffonade.